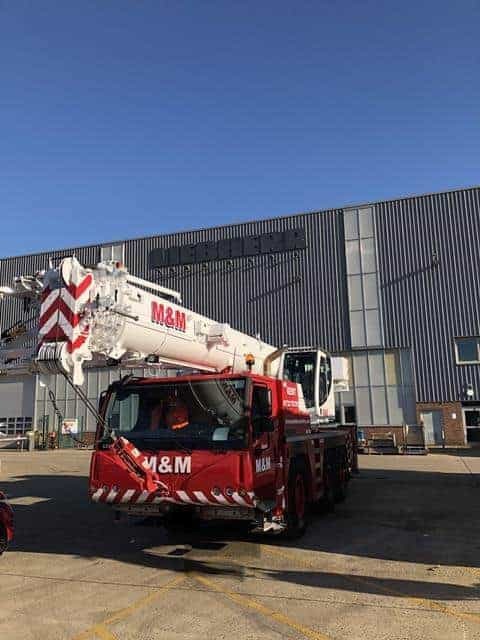 Crane rental specialist M & M Mobile Crane Hire has ordered three more Liebherr wheeled mobile telescopic cranes to add to its new depot in Kent, United Kingdom. They are a pair of LTM 1040-2.1s and an LTM 1090-4.1. It opened the new depot in mid-2017 and added seven cranes by the end of the year. The seven-unit order was for three LTM 1050-3.1 wheeled mobiles, an LTC 1045-3.1 compact mobile crane, an LTM 1055-3.2 wheeled mobile, an LTM 1090-4.1 and a used 2015 Terex Challenger 3160 wheeled mobile telescopic crane. The latest order, for three new cranes from Liebherr, will be delivered in 2018. The family run company has operated from the Slough area since 1988. Located in Sevenoaks, Kent, the company’s fourth depot also covers other areas of south-east England, including Surrey, Sussex, Essex and London.